Break off cauliflower florets and steam until tender. Set aside. Water sauté onion, garlic, green chilies, and mushrooms over medium high heat until juicy. Add in 1/2 cup water, add brussels sprouts and bring to boil. Lower heat to medium. Cover and cook about 10 minutes until tender. Blend cauliflower with steam water, seeds, Chicken Style Seasoning, nutritional yeast, and lemon juice until smooth. Pour all but 1 1/2 cups of sauce into vegetable mixture .Stir in chic peas. Spread remaining sauce on the bottom of 9 x 13 casserole dish. Arrange one layer of tortillas on top of sauce. Spread 1/2 the vegetable bean mixture over tortillas. Add a second layer of tortillas, and top with remaining vegetable mixture. Bake at 350 for 15 minutes, until bubbly. Add kale, mushrooms, garlic, and chili to a medium sauce pan, along with 3/4 cup water. Cover, bring to a boil, then lower heat to medium, and cook 3 – 5 minutes. Add spices and cook until kale is tender. Keep an eye on the water so it doesn’t burn. Add a little more water if needed. Add the black beans and heat through. Take off the burner and stir in mashed avocado. Salt to taste. Stuff them in a warmed corn tortilla. Makes 8 – 10 tacos. 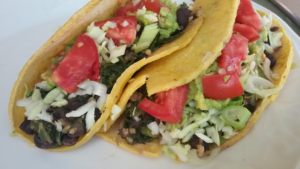 April’s note: I love this mixture rolled up in a corn tortilla just the way it is, with no toppings, but they are also wonderful with shredded cabbage or lettuce and fresh vine-ripe tomatoes. 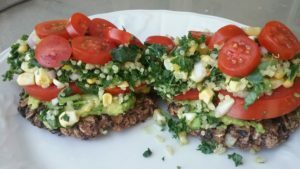 Enjoy these delicious patties as a burger or a “stack,” topped with a spread of avocado and topped with Simple Kale Salad, Simple Quinoa Salad and garden fresh tomatoes. The only vegetable in the fridge was a head of cauliflower and I really wanted Mexican food. 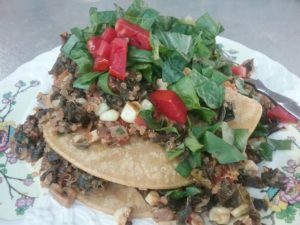 So I did a recipe search for cauliflower tacos, came up with a few selections and created a recipe of my own. These were very delicious and quick and easy to make. Boil 1 cup water. Add lentils, cover, and cook until tender. Add more water if needed. Saute onion in a dry medium sauce pan over medium high heat until they start to brown. Add garlic and cauliflower and a tablespoon or two of water and continue to saute for 5 minutes. Add mushrooms and spices and cook until cauliflower is tender. Drain off excess water from lentils then add cooked lentils to cauliflower. Mix well. 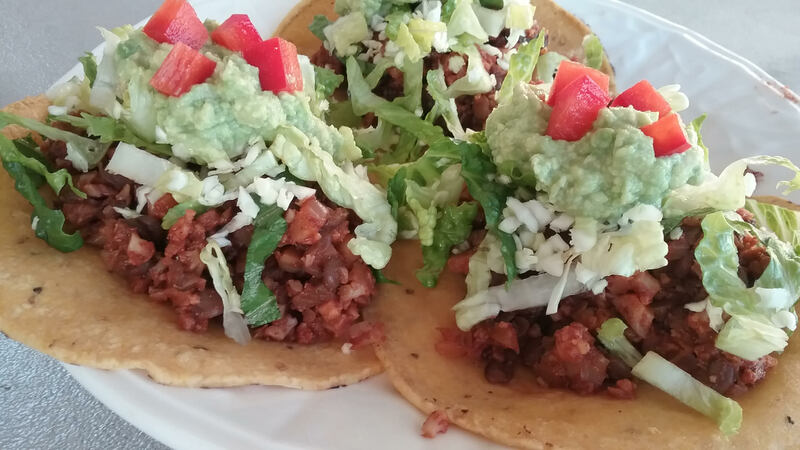 Soften corn tortillas by steaming them in a double boiler for 15 – 20 seconds. Fill with cauliflower taco meat, top with shredded cabbage, tomato, guacamole, and salsa. Saute onion in 1/4 cup water for 2 minutes. Add garlic, carrots, greens, and 1/2 cup water. Cover and cook 5 minutes. 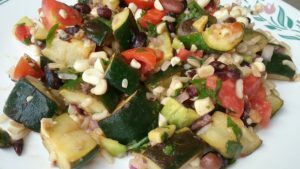 Add broccoli, mushrooms, and zucchini. Cook 5 minutes. Add spices and beans. Cook until vegetables are tender. Stir in 1 1/2 cups Green Chili Cheeze Sauce. Salt to taste. Add 1/4 cup water to remaining cheeze sauce. 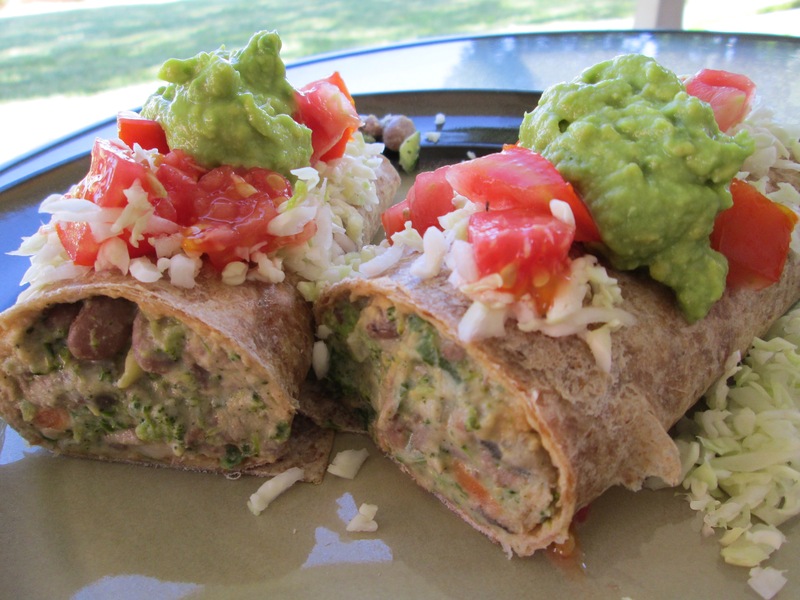 Roll burritos and drizzle remaining cheeze sauce over them. Garnish with chopped fresh tomato, avocado and cilantro. Blend all ingredients in a high-powered blender until smooth. If needed, soak seeds in water for 4 hours to soften and ease blending. With an abundance of beet greens growing in my garden and a great love for Mexican food, I decided I need to try pairing them up. 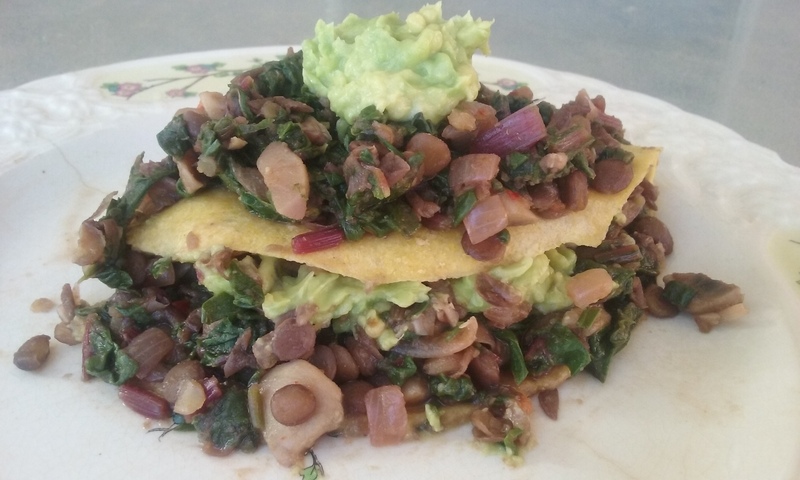 To make this really unique, I used lentils instead of the traditional black or pinto. I was very happy with the end result! 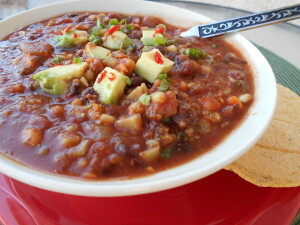 Boil 2 1/4 cups water in a sauce pan, add 1 cup dry lentils, cover, lower heat to medium low and simmer for 25 – 30 minutes. Lightly brown onion in pan over medium high heat stirring often to keep from sticking. Once brown, add 1/4 cup of water, garlic, mushrooms, jalapeno, and a big bunch of chopped beet greens. Steam for 5 minutes until beet green are wilted down. Add 1 tablespoon chili powder, 2 tsp cumin and cook a few minutes more until greens and mushrooms are tender. Stir in cooked lentils. Salt and adjust seasonings to taste. Soften corn tortillas in a hot dry skillet. Fill corn shell and top with guacamole. 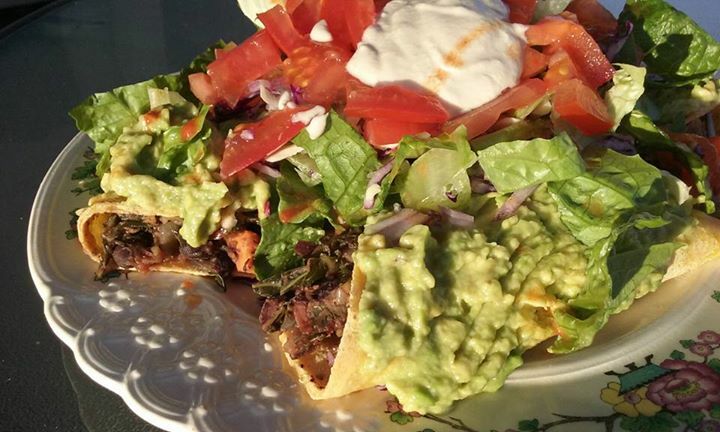 I like to fill the shell, lay it on my plate, then top it with more filling and then guacamole. I added some salsa to this as well. Saute onion in a dry skillet over medium high heat until they start to brown and become caramelized. You may need to add a tablespoon of water occasionally to keep from sticking. (If you have a good quality pan and it’s not too hot, you shouldn’t have to add any water at this point.) When browned, add garlic, chilies, sweet potato, kale and 1/2 cup water. Cover, bring to boil, reduce heat to medium, stir in spices* and mushrooms and cook until kale and potatoes are tender. Stir in beans, heat through and salt to taste. *I like to use other spices sometimes like Mrs. Dash Southwest Chipotle or Fiesta Lime. Soften corn tortillas in a hot dry skillet or steam them until pliable. Spread on sweet potato bean mixture, top with shredded cabbage, guacamole, and salsa.